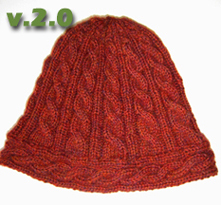 First, the release of Annie Modesitt’s new book: 1000 Fabulous Knit Hats. Even though none of my hats were amongst the winning ones, I have 4 of them in there. I know! I contributed a whole .04% of that book. I only wish I knew which of my hats are featured. I think I submitted pictures of at least 6 of them. I guess I’ll have to buy the book to find out. 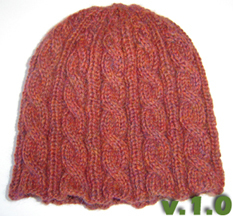 Just think, I can now include the sentence “As Featured in 1000 Fabulous Knit Hats” to the pattern of those selected! And as if that isn’t enough, one of my patterns has been selected to be featured in the 2011 Knitting Pattern-A-Day calendar. My Clamber cap is Miss February 21, 2011! She is all a-twitter…see? And last, but certainly not least, I’m getting published in a honest-t0-goodness magazine: I will have a pattern in a upcoming issue of Yarn Forward. I’m not quite sure yet which issue the pattern will be in, so if anyone subscribes to Yarn Forward and sees an Eton Cap pattern by Laura Wilson-Martos, please let me know! Also, if anyone has any extra pattern-writing mojo, can they send it my way? I’ve got 2 patterns I need to transfer from my head and scrawled notes into charts and written instructions, and also test knit 2 more sock patterns before publishing them. 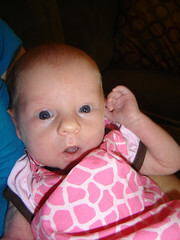 But, it seems like all I want to do is knit on the February Baby Sweater for my newest little niece, Meilena. Look at the hands on her! She’s a natural-born knitter if ever I saw one! You’d be hard-pressed not to go all melty at the adorableness! Congrats! I think I have a hat in there too – like you I will have to buy the book to check 😉 Yarn Forward are great to work for – I’ve done a couple of designs for them and have a couple more in negotiation ( hopefully) oh! and your niece is adorable! Congratulations on having your designs published! just cast on an Eton cap for my cool teen daughter. It’s a fab pattern!